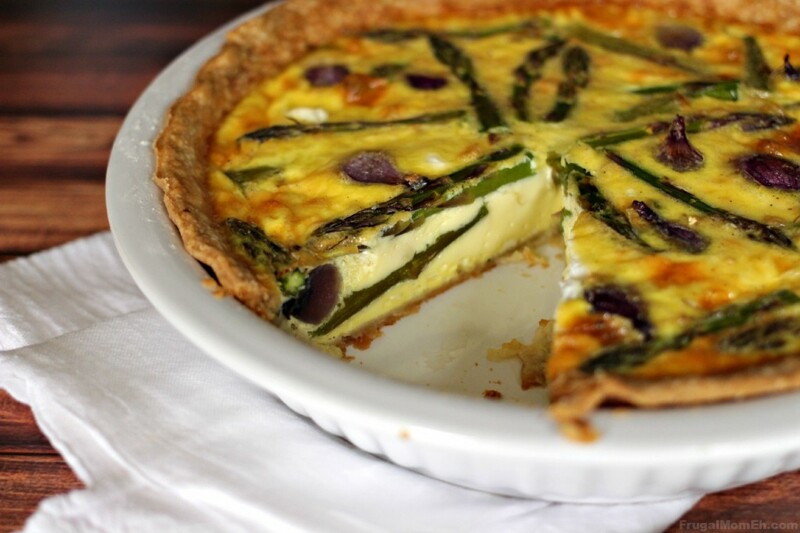 Asparagus, Goat Cheese and Pearl Onion Quiche - Frugal Mom Eh! Did you know that there are currently over 300 million hens in Canada and the US suffering through lives of intense pain and inhumane confinement. All with the goal of putting eggs on your table. Hens often spend their entire lives in small cages shared with 5 or 6 other birds, working out to a space the size of an iPad to themselves. Compare this to what it would be like for you to live with 10 other humans in a space the size of an average elevator. Cramped and Claustrophobic come to mind. They are stacked in rows filling big dark warehouses. Hens are intelligent, social animals yet they spend their lives unable to spread their wings or even turn around. This leads to their bones becoming brittle, and they are bruised, battered and some cannot even stand. This is not the case for Hens lucky enough to live out their lives on cage-free farms. They are able walk around, stretch out their wings and do all the things hens like to do, such as dust bathe, peck at the ground and more. They are happier and much healthier hens. Cage-free flocks even have a much lower incidence of Salmonella contamination. For more information about why you should choose Cage-Free Eggs please visit the WSPA Choose Cage Free Website and take a moment to Sign the Pledge to Choose Cage-Free! 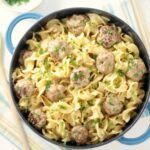 I didn’t use any herbs or spices as the ingredients, especially the Eggs, really speak for themselves and come together for a creamy, savoury party in your mouth. It’s also kind of pretty too, don’t you think? Saute Onions until softened, about 3 minutes, then add the asparagus stalks for a further 3 minutes until they start to soften. 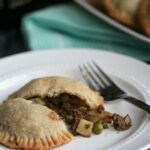 Spread the vegetables in the bottom of the prepared crust then sprinkle the goat cheese over the mixture. Whisk together eggs, half and half, salt and pepper then pour over the vegetables. Place the reserved asparagus tops on top of the egg mixture. Bake at 350 F, uncovered about 40 minutes until a knife inserted in the centre comes out clean. 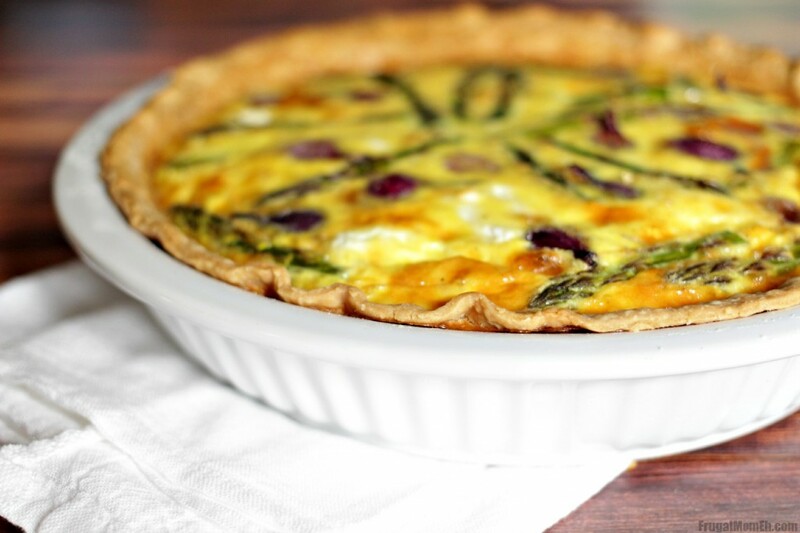 Allow Quiche to cool for 10 minutes before serving. Choose Cage-Free is an initiative by the World Society for the Protection of Animals (WSPA) to educate consumers about the real living conditions of hens in cages. They are empowering everyone to commit to cage-free eggs and are working in partnership with farmers and businesses to adopt cage-free practices. By taking action – by making a pledge and buying cage-free every time – we can all create change and improve the lives of millions of hens. Change is possible. Make sure you Sign the Pledge to Choose Cage-Free, and encourage your family and friends to do the same! 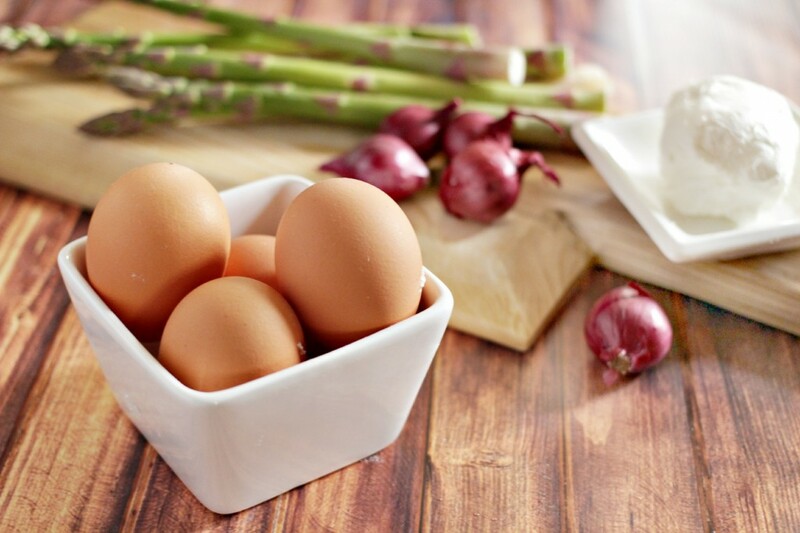 What is you favourite recipe that showcases Eggs? That Quiche looks incredible! Love the ingredients, my faves…. 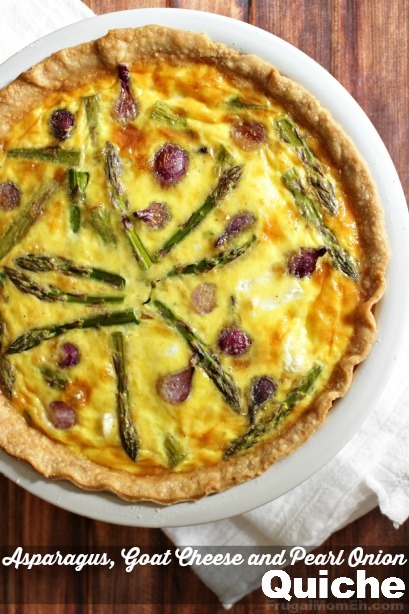 Your quiche looks amazing and yummy. pinned to try. found at titus2tues. have a great week. What a wonderful looking quiche. Thank you for sharing with us at Simple Supper Tuesday. Oh this looks soo good. I seriously need to hire someone to cook for me, or move next door to you! 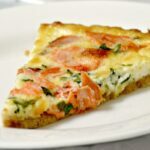 Your quiche is gorgeous and I love the combination of ingredients! Stopping by from The wednesday roundup. That quiche looks delicious! I love the look of the pearl onions. Stopping by from Momma Lew: Pin it Party. Looks delicious…pinned! Hi Elizabeth, I am always looking for yummy brunch recipes and this looks deeelish!! Thanks for sharing on Wake up Wednesday Link Up!! HI! Thanks so much for linking up at The Wednesday Roundup Link Party! This quiche looks wonderful! Pinning now! Oh my!!! That looks fantastic!!! I love asparagus so much! Thank you for sharing the recipe. 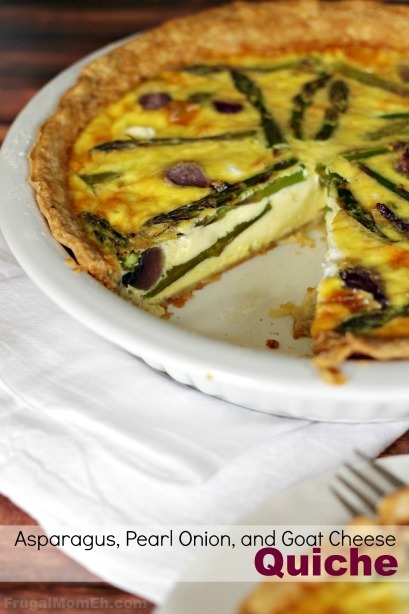 This quiche has a beautiful presentation as well as delicious ingredients! 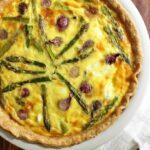 Quiche is a favorite in our house, as well as asparagus! Thank you for sharing this recipe. It looks so delicious and I can’t wait to try it. 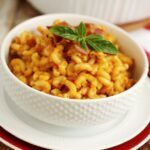 Thank you for this lovely recipe! Quiche is such a classic dish. I’ve never had pearl onions before, but I bet they add a special something to this meal. Love the addition of goat cheese! Sounds and looks delicious! I’m looking forward to trying it. I love this! 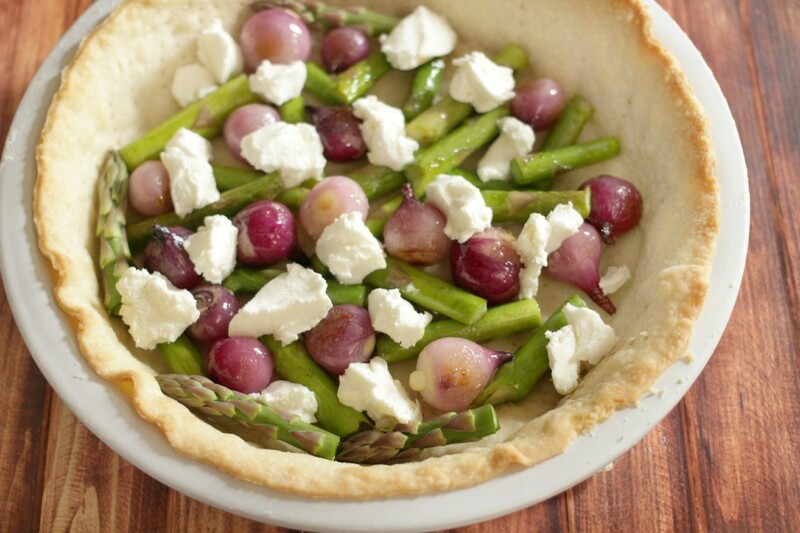 Pearl onions and asparagus are two of my favorite ingredients. This looks excellent. I have not made a quiche forever.